Well, just like that, summer’s over! Pumpkins are appearing, the days are getting shorter – but here at ClassAction.org, we won’t let that distract us. This month, we’ve got problematic pressure washers, more questions than usual about the SATs, and some serious problems with the way insurance companies are operating. Then, as always, we’ve got the latest settlements and all the news you need. Read on! Does High-Chair Maker Ingenuity Need to Clean up its Act? Look, kids are messy – which is why a high chair with a dishwasher-safe seat sounds like a great idea. Consumers who bought certain Ingenuity high chairs, however, have complained that the seating pads warp and/or shrink when washed as instructed. 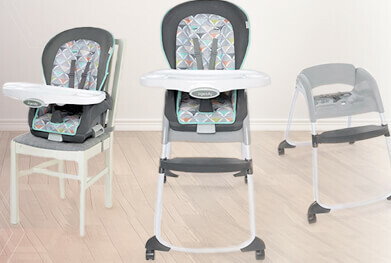 The issue reportedly affects Ingenuity’s SmartClean Trio 3-in-1 high chair, SmartClean ChairMate high chair, and the Baby Base 2-in-1 booster seat – all of which were in some way marketed as being “dishwasher safe.” If you had issues after putting your chair's seating pad in the dishwasher, we’d like to hear about it. Lawyers working with ClassAction.org are trying to determine whether a class action lawsuit can be filed and any information you provide can be helpful to their investigation. If filed and successful, a lawsuit could help you get some of your money back and force Ingenuity to change the way it labels and sells its products. Learn more. Forced to Pay a Deductible After an Uninsured Motorist Claim? Did you have to meet a deductible after filing an uninsured motorist claim for an accident that wasn’t your fault? If so, you may be able to help get a class action lawsuit started against your insurance company. Several states have laws in place that prohibit auto insurers from applying deductibles on uninsured or underinsured motorist claims if the policyholder was not the one who caused the accident. However, it looks like some companies are levying these deductibles anyway, telling their customers they’ll get their money back after the company goes after the other (uninsured) party. Unfortunately, this payment rarely ever happens. Even in cases where the policyholder does get their deductible back, there’s supposedly been no compensation for lost interest – something that seems particularly egregious if the deductible was illegal under state law to begin with. GEICO has already been sued in Tennessee over this alleged practice – and it’s one that’s got to stop. If this sounds like something that happened to you, get in touch today to find out how you may be able to get your deductible back. Did you know that in 11 states mortgage lenders are required to pay out interest on money held in escrow accounts? I bet you didn’t, but it’s true – and now attorneys are looking into whether lawsuits can be filed against lenders who aren’t paying their share. The states in question – California, Connecticut, Iowa, Maine, Maryland, New York, Minnesota, Oregon, Rhode Island, Utah and Vermont – have laws in place that mean lenders need to pay you up to 2% in interest on the money you’re holding in escrow. Your year-end mortgage statement should show whether your account is accruing interest, and if not, you may be able to start a class action lawsuit against your lender. Citibank has already been sued in California for allegedly failing to pay out interest, and it’s possible other banks and mortgage lenders could soon face lawsuits. Think you may be owed money? Read more here. Patients diagnosed with gadolinium deposition disease (GDD) after being injected with gadolinium-based MRI contrast agents are now taking legal action against the companies that manufacture the dyes. The suits claim that certain gadolinium-based contrast agents can cause serious cognitive and nervous system problems and that not enough warning was given to patients prior to their MRIs. Persistent symptoms, including headaches, bone and joint pain, painful tendons, and “brain fog,” have been linked to the administration of these dyes – and have even been observed in patients with normal kidney function. In late 2017, the FDA announced that new warnings would be required on all gadolinium-based contrast agents, but for many patients the damage has already been done. Filing a lawsuit may now help patients recover compensation for medical bills, lost wages, pain and suffering, and other damages. Read more about these lawsuits on our new gadolinium page. A medical device commonly used in heart and lung procedures, known as a “heater-cooler,” is currently under investigation by the FDA following reports that it can spread bacteria during surgery, ultimately causing non-tuberculosis mycobacterium (NTM) infections in patients. These infections can cause serious complications and even death, and one particular heater-cooler, the Sorin 3T, has already been the center of dozens of lawsuits from patients and their loved ones. Common surgeries that use heater-coolers include cardiac bypass, valve surgeries and surgery on the thoracic aorta, though symptoms of NTM infection may not become apparent until months, or even a year, after the surgery. If you or a loved one has been diagnosed with an NTM infection after recently undergoing heart or lung surgery, you should know that lawsuits are now being filed and lawyers working with ClassAction.org are speaking to people about their rights. Read more. They Tried to Pass it Off, But They Failed: Was SAT Test a Duplicate? The College Board and Educational Testing Service (ETS) are facing a new lawsuit that claims an SAT exam from August of this year had already been used – in October 2017 in Asia. The suit says that the alleged use of an old test brings into question the validity of the testing system and cites a 2016 Reuters report that showed SAT testing was already compromised due to corruption within the industry. In this case, however, it seems that images of exam questions from the SAT test in Asia were posted on social media, meaning some students in the U.S. may have been able to practice in advance, or had even taken the test before. The lawsuit, filed by the parent of a minor, seeks to cover all students who took the SAT test on August 25th or 26th of 2018. Read on. Ah, air travel. It’s hard to imagine there are many more ways for airlines to mess up – but don’t worry! Attorneys have found another one. JetBlue and Delta are both facing proposed class action lawsuits over claims that the companies aggressively push customers to purchase “travel protection” when buying airfare – without letting you know that they’re getting a cut of the profits despite not being licensed to sell insurance. According to the suits, the airlines’ websites suggest that this insurance is “highly recommended” – all in the name of consumer rights, of course – though it’s really in the companies’ best interests when they allegedly receive a kickback from the insurance providers. While JetBlue and Delta represent that the travel insurance payments are simply a “pass-through charge” that's forwarded on, the suits allege that the airlines are acting illegally and are hiding how their relationships with insurance providers really work. Read more. Attorneys working with ClassAction.org have reopened their investigation into Troy-Bilt and Briggs and Stratton pressure washers following reports that the machines can lose pressure or even stall during use. A possible defect in the machines – thought to stem from the motor – may cause the pressure washers to break down after just 15 hours of use. Additionally, some users have reported that the carburetors can clog if the pressure washers sit unused for a certain period of time and that, as a result, the machines won’t turn on. Sound familiar? Get in touch today and tell us if you’ve had any of these problems.